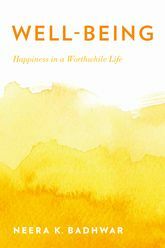 서명/저자 Well-being : happiness in a worthwhile life / by Neera K. Badhwar . 발행사항 New York : Oxford University Press , 2014. 서지주기 Includes bibliographical refrences and index. This book offers a new argument for the ancient claim that well-being as the highest prudential good—eudaimonia—consists of happiness in a virtuous life. The argument takes into account recent work on happiness, well-being, and virtue, and defends a neo-Aristotelian conception of virtue as an integrated intellectual–emotional disposition that is limited in both scope and stability. This conception of virtue is argued to be widely held and compatible with social and cognitive psychology. The main argument of the book is as follows: (i) the concept of well-being as the highest prudential good is internally coherent and widely held; (ii) well-being thus conceived requires an objectively worthwhile life; (iii) in turn, such a life requires autonomy and reality-orientation, i.e., a disposition to think for oneself, seek truth or understanding about important aspects of one’s own life and human life in general, and act on this understanding when circumstances permit; (iv) to the extent that someone is successful in achieving understanding and acting on it, she is realistic, and to the extent that she is realistic, she is virtuous; (v) hence, well-being as the highest prudential good requires virtue. But complete virtue is impossible for both psychological and epistemic reasons, and this is one reason why complete well-being is impossible.